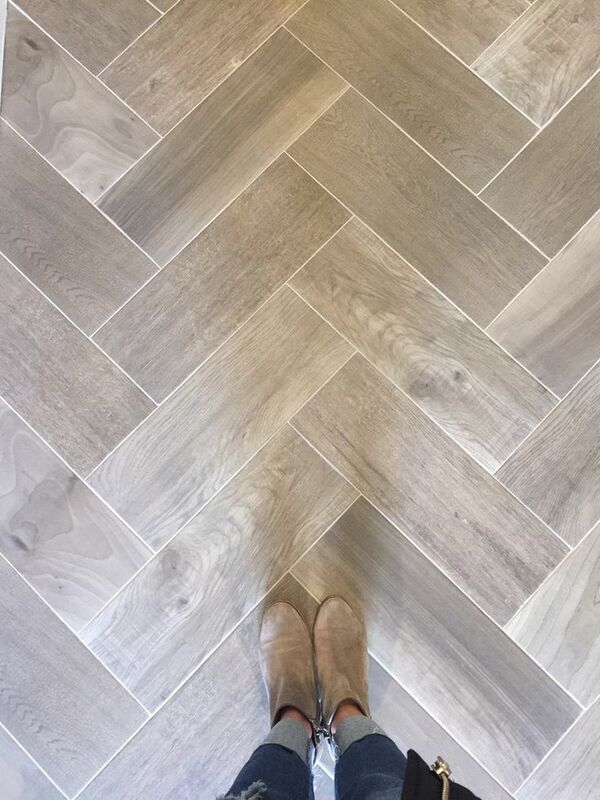 Wood tile (tile made to look like wood flooring) is one of those things that people are curious about but not sure if they’re ready to pull the trigger on it for their own homes. Personally, I think it’s a great concept and works great in many homes, but not every home. In case you’re considering it, here are a few pros and cons to consider as well as some tips. Durability, durability, durability. Did I mention it’s durable? This has to be the number one benefit of wood tile. If real wood flooring scratches, it’s not necessarily an easy fix. Tile is, well, tile. It’s hard and doesn’t dent or scratch like hardwood. Ease of maintenance. Real wood flooring, no matter what kind, can be a little high maintenance. You have to consider humidity levels of your home, make sure it doesn’t get wet, and use specific cleaners. Wood tile can be cleaned easily and is safe if it gets wet. Use in bathrooms. It’s not recommended to use real wood in bathrooms with showers because of the high moisture. 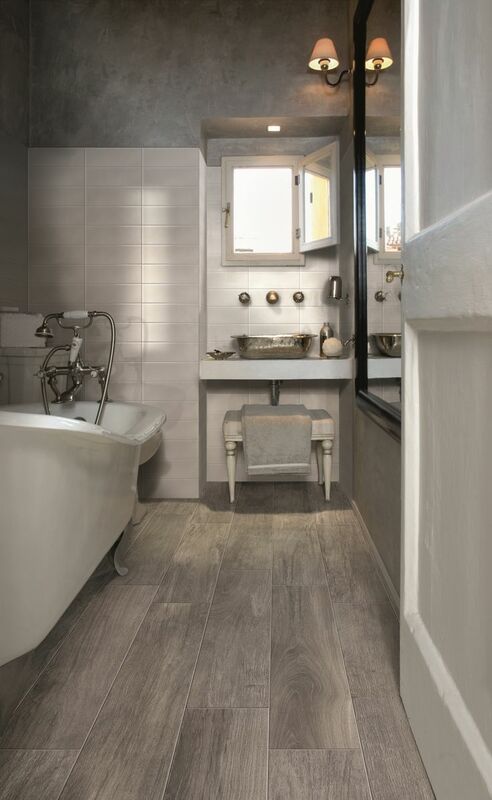 If you want the wood look in a bathroom, you can get it with wood tile and not have an issue. Custom look. 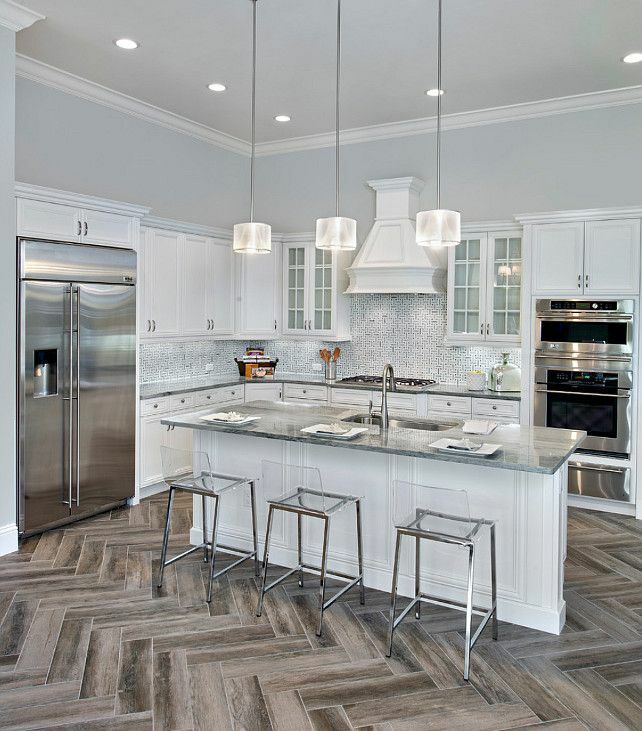 It’s a bit easier to create a custom look with wood tile versus real wood because of the endless installation designs, as well as variety of products available. You can also customize your look with grout colors or choose no grout for products that don’t require it. It’s cold. As with all tile, it’s cold under your feet. You can combat this with a heat system installed underneath, but it can get pricey. It’s hard. Again, as with all tile, it’s hard. If you drop something on the floor, that something is most likely going to break. Sidenote: I always recommend buying extra cartons of tile in case any tiles crack. It’s sometimes hard to find the exact tile a year or so after it’s installed and finding the exact dye lot is almost impossible. Also, if you’re standing on hard tile barefoot for long periods of time, you may notice a difference in your joints/back versus real wood. Pricey. Floor prep and installation is a bit more tedious than real wood so it can be more expensive. Resale. I’m not a real estate agent, but I do know that hardwood flooring helps with home value. It’s a classic. 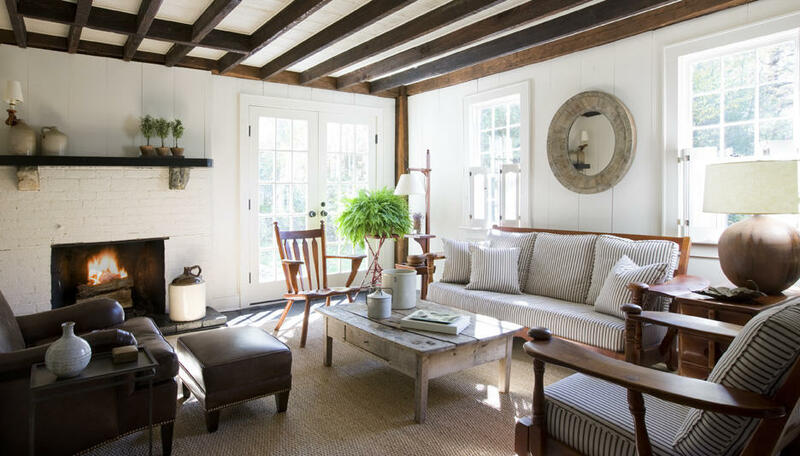 Wood tile is a newer trend and has a specific look, so if you’re concerned about resale, you may want to take this into consideration. As with any flooring, I always recommend seeing a sample in your own home before purchasing. Look at it day and night, cloudy and sunny, in the actual room(s) that you’re going to install it. Installation can make or break the wood tile look, invest in a professional tile installer. Your subfloor is very important to consider when installing, and wood tile products have specific installation instructions. It’s very hard and expensive to fix a tile installation gone wrong. 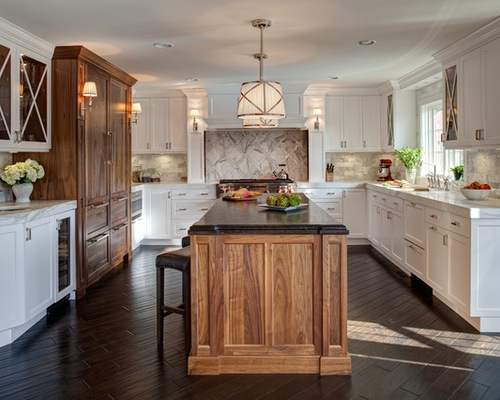 What do you think of wood tile? Do you have it in your home or would you consider it?